Circuits of the Wind is the story of Ray’s quest to find himself as he grows up wandering the computer underground—the wild, global outback that existed before the net went mainstream. How else does an end-of-century slacker reach out to the world from Sohola, that northern state that's a little more Midwest than it is New England? The net holds the key to what he's after—but even as he pioneers this virtual world, the veneer of his real life begins to crack. 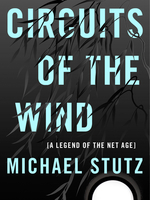 Volume One of the Circuits of the Wind trilogy follows a young Raymond from his ’70s childhood—and first gropings with the telephone—to the home computers and bulletin boards of the ’80s, where he leads a double life as a wanderer of the wires. But when even his virtual best friend unplugs, Raymond might have to leave it, too—because isn’t real life supposed to be offline? In Volume Two of the Circuits of the Wind trilogy, the net arrives all glimmering when Ray is starting college: it’s brighter, quicker, better than he ever knew. It’s the early ’90s—a time of golden youth and of joyriding on the growing Internet, where he rises as a leader of the global generation, the ones who saw it as the gilded portal to a fabulous new age everyone was about to enter. But he’s coasting aimlessly—and when his college friends move on and fashions change he sees how real life actually might not be working out. In Volume Three of the Circuits of the Wind trilogy, Ray gets a data entry job with an outbound line just so he can live constantly, and secretly, on the net—and after he succeeds in business without really trying, he finds even more excitement and success as an online correspondent in the booming Web of the dot-com ’90s. He’s living on the net, feeding off the very pulse of it, but it’s still not what he’s after—his entire life of wandering online seems to be a total waste. Or is it? HE KNEW the telephone early. Where there once had been indifference, when first he’d only noted just an olive-colored blemish on the wall, soon came recognition and finally even curiosity. In time the thing took on a great significance. It would sometimes shake the room in a flaring jingle, causing everything to freeze, and the lady would rush over to attend to it. It went like this no matter what—the lady would stop everything and run. She'd quiet it, speak importantly around it—perhaps even direct it—and he wondered if she'd set a timer to make it ring, for she seemed to control it sometimes by lifting up the handset while a finger carefully revolved the dial front. She’d stand there for great lengths of time, gesticulating wildly—dictating to, conversing with, nodding toward, or otherwise influencing it, all the while with the handset propped up to the side of her head in what at first appeared to be comedy, but sometimes became a long and tedious routine. It was some while and not without false trails before he discovered that voices fell from it: there were times when she held the handset to his head, and he was prodded, coaxed, urged to speak, and she’d tell him that these other people could hear him, she’d perform a litany of names; after confused deflections where he convulsively pushed back for fear that it might injure him, the magic was revealed one day when he finally acquiesced and felt the soft pitches of sound tickling the inside of his ear—and to her happy praise he quickly gurgled an acknowledgement. Once he understood something of its workings, when he knew how it would pitch and jingle and then bring up the soft voices, he thought that it was a connection to the other side of the kitchen wall—he thought that there were adult neighbors sitting back in there, beyond the green and silver stripes of wallpaper, and that they were talking to them through it, summoning them at all hours. Eventually he came to know that it actually reached out well beyond all that, through long wires, and soon enough he learned that the whole entire world was connected to it, was accessible from there and waiting for him at the end of a phone line. The lady told him this, he saw no reason to disbelieve her, and yet he harbored doubts—for it scarcely seemed possible. He’d stare at this fantastic gateway to the world and soon decided that it’d somehow bring him to his future, this great connecting force that wrapped around whole entire planet and brought everything imaginable to the striped wall of their kitchen. They were in the city of Clifton, one of the three-dozen great cities that had been built and blossomed there in the land of America, a sprawling metropolis along the upper edge of that crossroads state they call Sohola, which had the whole of America inside it—the nation ended abruptly at its northern shoreline, where beyond the soft ripples of the inland sea there was nothing but the vague promises of Canada, while if you drifted far down toward its southern border you’d notice that everyone had a different accent, and it never snowed so much in winter, and grits were on all the breakfast menus; it was also the state where New England undeniably saw its final end in those forested hills that tapered off along its eastern sections, where they&rsqo;d come tumbling down from Ithaca in New York state, and Pittsburgh, Pennsylvania, and other points in that Appalachian highland that cupped the whole East Coast—and everybody knew that it was the place where the Midwest decidedly began, with all that farmland across the loamy plains that stretched all through the bedded night so long into the west. Clifton pressed up tightly against the cold gritty shores of Lake Catawba, one of the vast and endless Great Lakes, those cool and glimmering inland seas of old America. In its downtown city core it was much smaller than Chicago, but the suburban mass of greater Clifton, radiating out in all directions south along the shore, held a sprawling land mass just about the size of the entire state of Rhode Island. 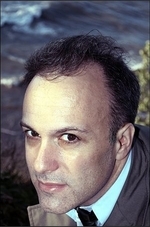 MICHAEL STUTZ coined the phrase “net generation” while working as a reporter for Wired News—and in the early 1990s kicked off the Wikipedia era by being the first to take “open source” beyond software. He lives in Space Age Central, the former home of the NASA rocket scientist who planned the Apollo Project. Available in trade paperback and for Kindle.